This summer I had the privilege of sitting in on interviews for a new ELA teacher in my building. In my fourteen years in the district, this is the first time I have been able to take part in something like this, and since the hired person will be my classroom neighbor and part of my 8th grade team, I wanted to throw my own voice into the decision-making process. Like many districts, we have a set list of questions we ask each candidate. We are free to ask other questions; however, and I had one in mind that I asked each interviewee: What is the last YA lit book you read, and what would you recommend to a reluctant/non-reader? This question was more than just personal interest, although I admit to always wanting to know what people are reading. I asked it to find out how in tune each interviewee was to what is being written for young adult and middle-grade readers. How they answered told me how well they would fit the job they were interviewing for as much as their answers to any of the scripted questions. We had a number of candidates come through and I liked something about everybody, but I knew who would be a good fit for us based solely on their answers to my questions. One claimed a love of all things Neil Gaiman, and while I have some students who certainly love some of his work that is geared toward a younger audience, they are usually my stronger readers. The new teacher would be teaching our most at risk readers, many of whom claimed to hate reading. Some might be attracted to Gaiman’s darker work, this candidate seemed a better fit for teaching high school–and probably a Brit Lit class. Another who was fresh from her student teaching, admitted she hadn’t had much time to read for pleasure as of late, but she thought that Harry Potter would be good for a struggling reader. Listen, I’m not here to start a war with all of our Harry followers out there, but the series is twenty years old. It can’t be considered new at all. And again, while I do have some students who still fall in love with Hogwarts, it’s not usually my “non-readers”. Our school is an urban Title 1 district. We have a few kids who love wizards and fantasy, but most need to find themselves in a book. I’m not arguing that we aren’t all Harry Potter, but it’s hard to argue that the answer was a bit of a cop out. On the other hand, we had one candidate who proclaimed herself a gamer and that she loved books like Ready Player One by Ernest Cline. She wasn’t just a sci-fi fan though. She listed a number of new, high-interest books that would appeal to our diverse population. A few other candidates easily mentioned books by Sherman Alexie, Matt de la Pena, Jacqueline Woodson, Andrew Smith, A.S. King, and everything in the Blueford High series. I found myself nodding along. These are the kinds of teachers I want to hire: the ones that know YA Lit and can talk about these books with their students. All the current research, for example by Wilhelm, Smith, and Fransen (2014), show that student choice in reading is the path to higher engagement. It’s time to quit assigning specific books and instead build our classroom libraries so students can have choice. It’s not good enough to have the books available, though, if we can’t talk about them and help our students find the right one. We need to be reading what we hope they will fall in love with. Part of being a life-long reader–someone who reads just because they want to–is the social part. Reading, even though done usually in isolation, is a highly community-driven activity. When we finish a book we loved, we want to tell someone. That’s why Facebook has so many book groups people can join. It’s why GoodReads was developed. We want to talk about what we love–and hate–about the books we read. Teachers–ELA teachers specifically, but I would argue ALL teachers–should be able to talk books with their students the way they talk TV shows, movies, video games, and sports. If we want our students to read, we need to read, and we should be reading what they read. 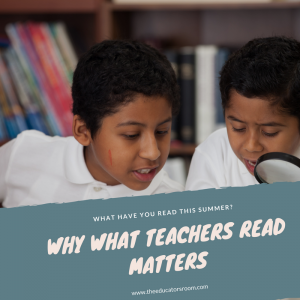 If you need a place to start, I recommend checking out Penny Kittle’s reading lists and for more middle-grade titles looking at Donalyn Miller’s blog. I also write about YA Lit books here and on my own blog. Wilhelm, J. D., Smith, M. W., & Fransen, S. (2014). Reading unbound: why kids need to read what they want-and why we should let them. New York: Scholastic. Yes, yes, a thousand times yes. I’ve been on a couple of interview committees. Your interview question is the one I always ask, too, and the answers are revealing.